Two Morrows Publishing, 9781605490618, 256pp. 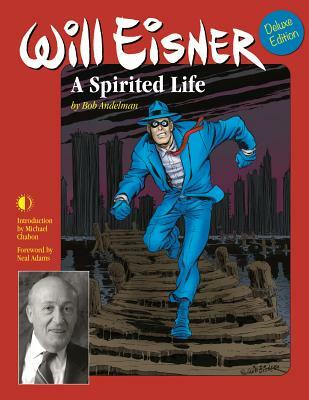 An expanded, full-color deluxe edition of the out-of-print biography that explores the fascinating life of Will Eisner, detailing a more than 70-year career where he spearheaded comics for adult readers and created the first widely accepted graphic novel, A Contract with God. Eisner's influence has been felt by such diverse talents as Batman creator Bob Kane and Jack Kirby, as well as underground comics legend R. Crumb and Pulitzer Prize-winning cartoonists Jules Feiffer and Art Spiegelman -- all have hailed Eisner's cinematic approach to comics, and his enduring character The Spirit. From his childhood to famously turning down a proposal for Superman, to educating Army soldiers in P.S. Magazine, Eisner's personal and professional life is told in dramatic detail. Author Bob Andelman spent almost three years interviewing Eisner prior to his passing, researching his life and work and interviewing friends, family, and colleagues including Alan Moore, Dave Gibbons, Neil Gaiman, Denis Kitchen, Joe Kubert, Stan Lee, Jules Feiffer, Neal Adams, and Patrick McDonnell. In addition to hundreds of full-color images from Will's archives and private collections (not found in the original edition), this expanded Deluxe Edition includes a series of new interviews with Drew Friedman, Howard Chaykin, Darwyn Cooke, Sergio Aragones, Michael Uslan, and others, which clear the air on some topics left unfinished by the first edition, and add depth to the reader's knowledge of Eisner's body of work. Featuring an insightful introduction by Michael Chabon.